Baby Digger loves most of the shows on Nick JR including Pocoyo. Pocoyo is an adorable show featuring Pocoyo and his buddies. I was excited when we were asked to review the new Pocoyo Swiggle Tracks, I didn’t even know there were Pocoyo toys prior and after checking this toy out I was even more excited. Pocoyo Swiggle Tracks comes with a battery operated car with Pocoyo driving, tracks that you can build and configure to many shapes, a moving bridge and a ball for Pocoyo to push around the tracks. What I love most about this toy is that it lets your child use their imagination to create a track setup of their own and have fun watching Pocoyo drive around it pushing the ball along as he goes. You can even set the tracks up into a circle and Pocoyo will motor around thr room. Baby Digger is now 15 months and shes really fascintated by Pocoyo Swiggle Tracks even though right now she needs help building the tracks. It’s really nice to sit down with her and build a track together, she’ll hand me the track pieces one by one and I’ll put them together for her. This is a great toy that inspires kids to use their imagination. I really love almost everything about this toy but one thing. The car plays the Pocoyo theme song on a loop over and over again. Which, after a while becomes pretty annoying for mom and dad. I would love it if you had an option to turn the music off and just have the car on so it could drive the tracks without music. Other than that it’s a wonderful toy and Baby Digger has had lots of fun playing with it! 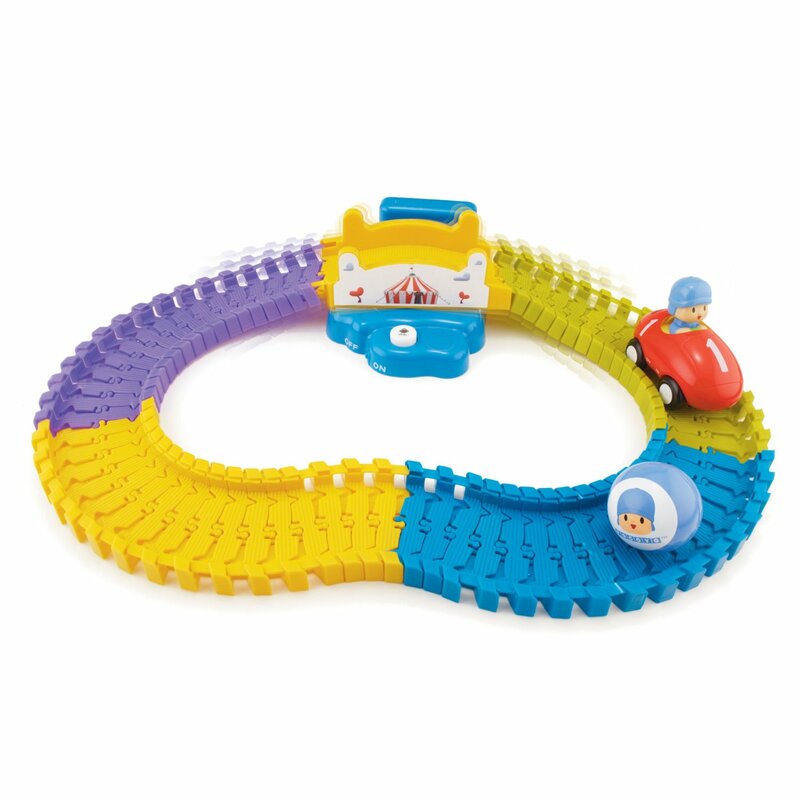 Pocoyo Swiggle Tracks are available to purchase at www.amazon.com for $29.99 with Free Super Saver Shipping! Newest follower on GFC and Google +. Would love a follow back if you have a chance. What a fun train set for the little ones! Thank you for the review!! Great toy at a great price..thanks! How adorable! We’re big Pocoyo fans over here! Thanks for the review. My guy is too little for this but I like to read about the characters he mgiht be into one day! Looks fun and affordable too! My son would love this. Thanks for the review.